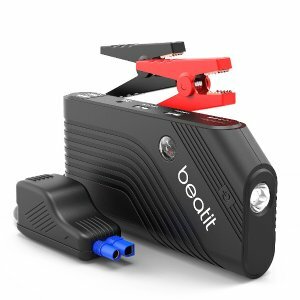 Amazon.com offers the Beatit B9-B-O Portable Car Jump Starter Booster for $39.49. Features: Jump start your vehicle (up to 5.5L(T)gas or 4.0L(T) diesel engine or Motorcycle ,oil boat and sleigh, ect) up to 30 times with 600 amps of peak current and heavy duty clamps and cables.Car Jump Starter has an incredibly large 14,000 mAh capacity battery, which means you can crank up any size of passenger car. Compact enough to store in your glovebox.